The files marked with a , are in portable document format: pdf. You need the Adobe Acrobat Reader to view it. If you do not have this free reader, you may download it by visiting the Adobe website. A product of Northern Illinois University Libraries Digitization Unit, this resource brings together primary source materials from a number of libraries, museums and archives. These institutions include the Newberry Library, the Chicago Historical Society and the Illinois State Library. Access digital publications available from the Illinois State Library on the Civil War including journals, documents, reports, newspapers and much more. Illinois Civil War Muster and Descriptive Rolls Database. Outstanding site with pictures and information on Civil War flags from Illinois. Civil War Resource Guide hosted by the University of Houston and developed in collaboration with the Chicago Historical Society among others. Illinois Civil War regiments by county. Vestiges of an Nation Divided: The Civil War’s impact on northern Illinois, on line exhibit. National Park Service’s summary of Illinois’ role in the Civil War. 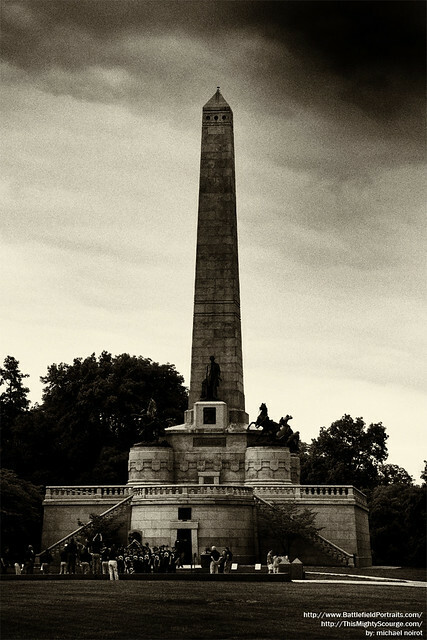 This site includes a list of battles, information on a number of Illinois Civil War veterans, and articles on topics of interest. pamphlet from the National Park Service. Brief history of African Americans in Illinois from territorial times through the end of the 20th Century. The African American Odyssey: A Quest for Full Citizenship online exhibit explores black America’s quest for equality from the early national period through the twentieth century. This link takes you to the Civil War section of the exhibition. A history of African Americans in the Civil War from the National Park Service. Aboard the Underground Railroad: A National Register of Historic Places Travel Itinerary introduces travelers, researchers, historians, preservationists, and anyone interested in African American history to the fascinating people and places associated with the Underground Railroad. The following are three sites listed on the National Park Service’s registry of Underground Railroad sites. Published by the Illinois Historic Preservation Agency and supported by the Illinois Lincoln Bicentennial Commission. Knox College provides full text PDFs of Michael Burlingame’s Abraham Lincoln: A Life. Rodney Davis and Douglas Wilson of the Lincoln Studies Center at Knox College discuss each of the Lincoln-Douglas debates via podcast. Gateway: Lincoln and the Civil War provided by Illinois Wesleyan University. The legendary “Rebel Yell” rediscovered by the Museum of the Confederacy. Last eye-witness to Lincoln assassination appears on television in 1956. 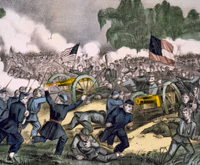 Animation of the Battle of Shiloh where General Grant took Forts Henry and Donelson. The Southern Illinois University at Carbondale has launched the Southern Illinois Civil War Collection. The digital collection assembles handwritten letters, diaries, and military orders spanning the era before, during, and after the American Civil War (1861-1865). The collection documents the southern Illinois experience of the war, and spotlights life on the home front from the perspective of two women whose husbands served in the Fifth Illinois Cavalry. Alton in the Civil War. Encyclopedia of Chicago webpage on Chicago in the Civil War. History of Southern Illinois during the Civil War. contains official histories of Civil War regiments and units as compiled by the Illinois State Archives. The Abraham Lincoln Presidential Library owns around 7000 images of Illinois “Boys in Blue.” This database lists the soldier’s name, regiment, town of residence, and other information. List of Illinois regiments including information on Illinoisans serving under other states’ regiments. Union regimental index for Illinois. A guide to the collection of six large record books from Company “M” of the 4th Illinois Volunteer Cavalry at Stanford University. It consists of a clothing book, a descriptive roll of the company, morning reports, the record of a general court martial, and an order book. Site of a reenactmment group portraying the 10th Cavalry Regiment, mustered from the counties of Sangamon, Logan and Menard. An Illinois Soldier in the Civil War contains photographs, memoirs, and documents on Private Jefferson Moses of Company G, 93rd Illinois Volunteers. The 41st Illinois Volunteer Infantry. Collection of online books and publications related to Illinois Civil War regiments. Illinois Boys in Blue images. This project includes nearly 600 scanned images of selected, original Illinois Civil War soldier photographs held in the Abraham Lincoln Presidential Libraryâ€™s Audio Visual Collection. Each soldierâ€™s photograph (including front and back images) is accompanied by cataloging information including the soldierâ€™s regiment, company, residence (town and county if known), and in many cases, the studioâ€™s name and location in which the photo was taken. To date, Illinois infantry regiments included in the database are the 7th, 9th, 17th, 33rd, 37th, 56th, 64th, 77th, 86th, and 108th. The 4th Illinois Cavalry is also represented. New York Times blog on women and the Civil War. Women Soldiers and Nurses of the American Civil War. Essay on Women and Gender Roles in Civil War Illinois and the North by Drew E. VandeCreek, Ph.D.
Site presents the Civil War including timelines, glossaries, maps and more. Online game for kids of Lincolnâ€™s White House during the Civil War.